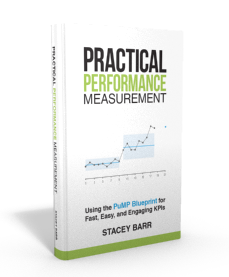 Measure Up reader, Srini, asks this question: “Is there a set of KPIs limited to 3-6 which can help ALL businesses and non-profits?” Most people ask questions like this when they’re just getting started with measuring performance. So while you take the time to also learn the process of designing the best measures for your organisation, here’s my suggestion of the top 6 things that are useful for anyone to measure, at any level in an organisation, in any industry or sector. The first three measures are from the perspective of stakeholders in the organisation: customers, employees and owners. The second three are from the perspective of the organisation’s processes. Spend as little time as possible tailoring them to your business; spend more time pilot testing them. You’ll learn tonnes more about the best measures for your business simply by getting started with something, rather than waiting until you’ve designed the best way to measure. Customer Satisfaction is the only measure of these six measures that will connect you with the relevance of your work. If customers aren’t happy, then everyone is wasting time doing the wrong thing, or doing the right thing wrongly. Measure how your customer perceives the outcome of your product or service, through surveys or at the end of each transaction with the customer. You can ask them directly, give them a survey form, or send them to a website form. You can ask all customers, or just a random sample of them. Employee Satisfaction is a tremendous driver of every other performance result. If employees are unfulfilled, unhappy and unsatisfied in their jobs, it’s hard for them to care about the performance of the organisation. There are more sophisticated ways to measure how engaged employees are in the organisation, like Gallup’s Employee Engagement Score. But this one will at least turn some attention to the importance of caring about how employees feel. No financial measure is going to stand on its own, but one of the useful ones that any organisation can learn from is Cash Flow. It’s simply the net flow of cash over a period like a month: total cash in minus total cash out. Plenty of organisations that generate high revenues and profit have gone down the gurgler because they didn’t have cash when they needed it. Defects is a measure of quality, and a translation of what the customer expects your product or service to do, into something you can count to assess how often the product or service actually does what is expected. Your Customer Satisfaction measure is a lag of this one. And the extra data collected about what customers most want you to improve for them will help you define what constitutes a defect (e.g. something breaks, something doesn’t operate correctly, a delivery deadline was missed, an invoice has errors). The time it takes to produce or deliver your product or service for your customer is a surprisingly useful thing to measure. It’s not just about meeting the time commitments you made to your customer. It’s just as importantly about focusing everyone on the things that make the Cycle Time what it is. And this is usually dead time between hand-offs in the process, waste and rework due to errors or lax standards, and even things that didn’t need to be done at all. It’s a lag measure of the next one, Wasted Time. You need a time log to capture data for this, so it does require some daily discipline to truly understand what proportion of available work time is wasted. Wasted Time is a lead measure for the previous one, Cycle Time. Remember, don’t try to get it perfect before you begin measuring anything. It’s not until you start using measures that you discover new questions and clearer information needs. Use these six basic measures as a springboard to get comfortable measuring. Then, through their use, you’ll get closer to understanding what you really do need to measure. 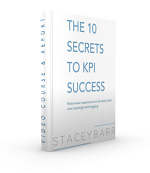 Do you have any teams that are true KPI newbies? Try out a few of these measures to get them started. Talk about the performance results they relate to, why they’re important, and include everyone in ideas for how to get them measured. What are customer expectation are short lead time, quality & Price. What are company should focus on speed, quality & cost plus stakeholder satisfaction. That’s interesting, Sue. They are two very important ‘inputs’ or ‘resources’ for achieving the other four things.